Warm and sunny weather is predicted today in Riverside, on what will be a nice day locally. Cooler weather will settle in for the weekend, with low pressure leading to morning low clouds, more daytime clouds. Today: Sunny and warm. Afternoon breezes , high near 86°F . Predicted air quality is moderate, AQI: 70 (for Metropolitan Riverside courtesy of the SCAQMD). Saturday: Low clouds and fog early, becoming mostly sunny. Afternoon breezes, high of about 71°F. Saturday night:Mostly clear, becoming mostly cloudy, low near 52°F. Sunday: Partly sunny, becoming mostly sunny. Afternoon breezes, high around 69°F. Sunday night: Partly cloudy, becoming clear, low of about 51°F. Monday: Sunny. Afternoon breezes, high near 79°F. Tuesday: Sunny and warm. Afternoon breezes, high of about 89°F. Tuesday night: Clear, low near 55°F. Wednesday: Sunny and warm. Afternoon breezes, high around 89°F. Wednesday night: Clear, low of about 57°F. Thursday: Sunny and warm. Afternoon breezes, high near 87°F. 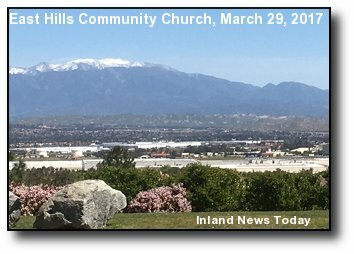 Jurupa Valley forecast updated daily. Based on data from the National Weather Service, San Diego office and from WeatherCurrents. October 9 99°F 63°F 80°F 0.00"
October 8 96°F 60°F 75°F 0.00"
October 7 86°F 56°F 69°F 0.00"
October 6 78°F 54°F 65°F 0.00"
October 5 72°F 57°F 63°F 0.01"
October 4 67°F 60°F 63°F 0.01"
October 3 85°F 58°F 69°F 0.00"